One of the things I enjoy about being on the BBQ circuit with Harry is traveling to places that I have never visited. 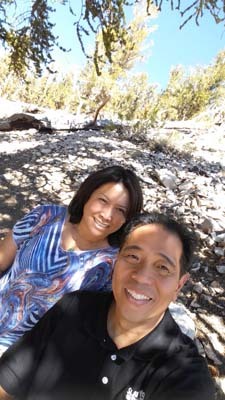 BBQ has brought me to Cameron Park, Placerville, Penn Valley, Clear Lake, Elk Grove, Woodlake, Viejas, Acorn, Wildomar, Temecula, Lancaster, Costa Mesa, Lake Puddingstone, Long Beach, Dana Point, Arcadia, and numerous other places. When you cook somewhere, you really settle in and soak up what the place has to offer. Sometimes you meet city officials who have a hand in bringing you there. Most of the time, you get a strong dose of the weather. It’s almost like being a temporary homeless person. You cook, live, and eat outside. But there are some places where it is probably too difficult to hold a contest. So you just have to push yourself out there and make it happen. 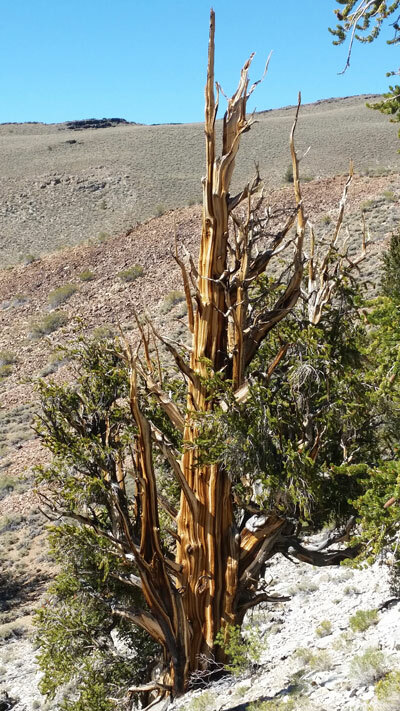 Harry wanted to check a place off of his bucket list, Ancient Bristlecone Pine National Forest. While surfing online for the world’s oldest living creatures, he stumbled across some fascinating articles about living trees over twice as old as Jesus, and even older than the Pyramids. 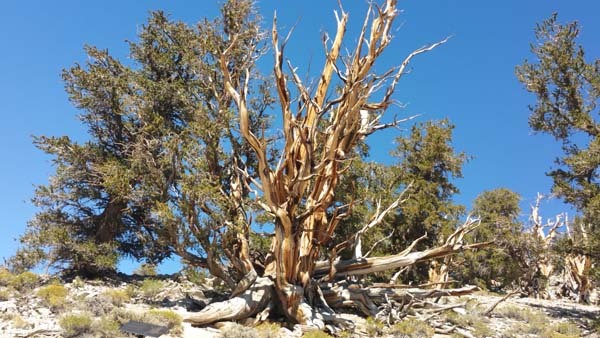 What surprised him was that these world’s oldest living organisms (4,000 to 5,000 years old) were were alive and hidden away in northern California at the Bristlecone State Park. He wanted to go, especially since it is only a few hours away from Los Angeles. I added on my personal wish to visit two other spots, Mono Lake and ghost town, Bodie State Park. All of these places are uncomfortably high. 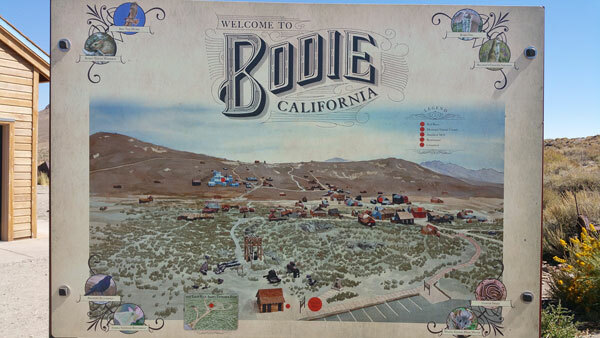 Bodie, a deserted mining town in Mono County is at 8,379 feet. Mono Lake is at 6,3878 feet, and the Methuselah Grove in the Ancient Bristlecone Pine Forest starts at 9,946 feet but you have to hike even higher to see these trees. As a young person, I often tried to push my limits, proving that I could do something. So I set goals like running a marathon, backpacking in the forest, climbing Half Dome or Mount Washington in New Hampshire. Strangely enough, I rank cooking BBQ solo as one of my better achievements. Then your body starts to age and you are reminded that your life is more than halfway done. If you don’t do it soon, you may never do it. I’ve been to enough funerals to change how I see the rest of my life. I am a kinder person; I don’t hold the cards too tight. Small things have more natural beauty. Bristlecone as a destination didn’t make sense when I was 26 but it made sense now. Harry rented a car with a solid motor and off we went on a Friday after work. Stalled by LA traffic, we gave up the freeway fight in Hesperia, falling asleep in a budget hotel along the 15 highway. By noon the next day, we were climbing up mining country. We passed a Crystal Geyser bottling plant in Olancha. 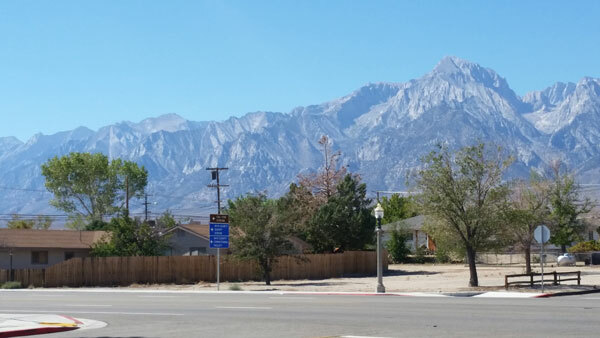 If you look westward, you can see Mount Whitney which pierces the earth’s atmosphere at 14,505 feet. It is the highest summit in the contiguous United States and the Sierra Nevada. It looks cold, grey and majestic; something Frodo would climb if he lived in California, rather than Middle Earth. Behind Whitney is Sequoia and Kings Canyon National Parks, where beautiful coastal redwoods and giant sequoias reside. To the east is Death Valley National Park, and the White Mountains. The view from this valley is breath-taking. The Sierra Nevada and Mount Whitney make up the background with dark green rounded mountains in the foreground. We are driving down a basin called Owens Valley which few Californians visit. The flat valley offer natural springs and pools of water that run off of the Sierra Nevada. To my right, I see a herd of hundreds of cows, migrating north, in a straight line. The leaders of the pack are big cows and know something I do not know; where are they going? I am stunned to see the richness of the area. Even though the average rainfall is a scant 10 inches per year, I am not in a desert. We are surrounded by plants that are naturally drought resistant. 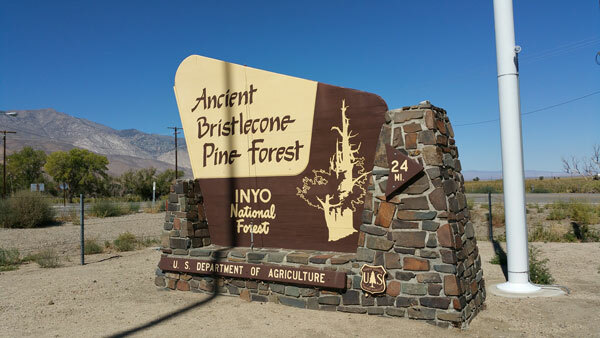 When we hit the town of Big Pine, we take a right turn and ascend past the 6,000 feet marker to the Ancient Bristlecone Pine Forest. The trees surround us like a brotherhood of ancient spirits. These organisms will outlive me, my daughter, and any of her descendants. A handful of them were here long before Moses. We reached the visitor center and parked our tired car. As I opened the car door, I was met with an overwhelming silence. No cars. No airplanes. No sirens. No trains. Just wind blowing against the mountain. I was truly amazed at how nice that felt. In the new visitor center, we met Ranger Dave Hardin, who is the happiest ranger I will ever meet. He was meant for his job. Harry and I did some Wiki homework in the car before we arrived so I had a few questions. We had a great conversation about Prometheus, the tree which previously held the title of the world’s oldest tree, and Dr. Donald Currey who cut it down. Dr. Currey is to nature lovers what Steve Bartman is to Cub fans. Both were well intentioned people who made one mistake that unfortunately defined them for the rest of their life. 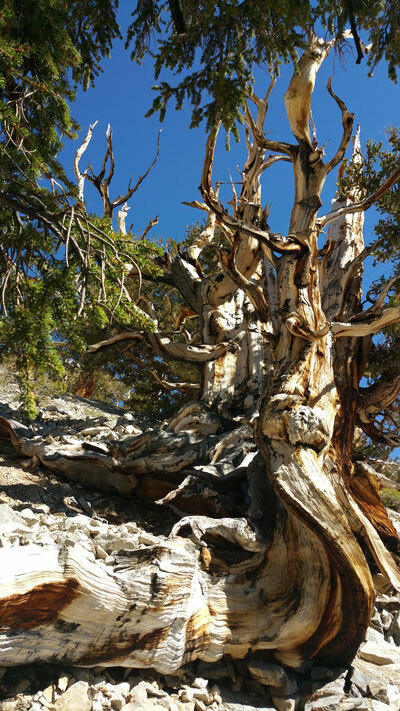 There are two trailheads, a one mile hike and the official 4.5 mile Methuselah loop with the Methuselah tree. We opted for the one mile trail, knowing that the actual tree isn’t pointed out on the official trial anyways. At 10,000 feet, we huffed and puffed cold crisp air and tried not to disturb the dolomite soil underneath our feet. Harry started getting a headache. None of the food I ate earlier was digesting. I could feel my lower esophageal sphincter not closing down. These were all symptoms of altitude sickness. As we approached these ancient treasures, we stood reverently. These were nature’s Mona Lisa, her Great Wall, her Sistine Chapel. The gnarled bark twisted in bright hues of brown, black and white. The oldest trees had exposed roots. The park ranger mentioned that each foot of erosion meant 1,000 years had passed. The greater the root exposure, the older the tree. The wider the base, the older the tree. I tried to predict which of the other trees would be the oldest in the next two or three thousand years. Some trees clearly had at least 5 feet of erosion which meant they were 4,000 to 5,000 years old. After an hour or so, we were eager to get back into our car and drive down to lower elevations where we could breathe easy again. We passed by a Texas style BBQ restaurant and were tempted to go in. But the sweet lure of Erick Schat’s Bakkerÿ was irresistible. We grabbed some thick sandwiches pressed together by dark grainy slices of bread and a few round loaves of bread and headed north. We spent the rest of the weekend visiting Mammoth village, Mono Lake and then Bodie State park. Mono Lake is a good lesson about California water politics, alkaline bodies of water, the ice age, bird migration and the importance of the Great Basin. 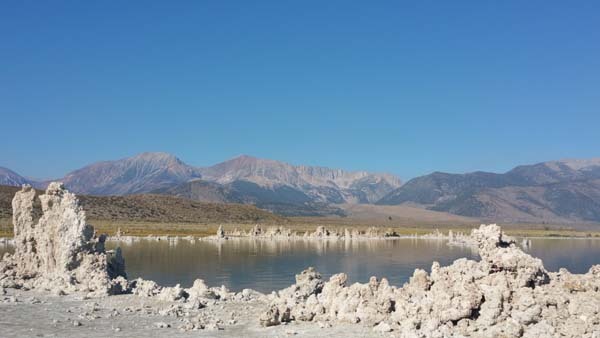 Believe it or not, Utah’s Salt Lake is considered to be a sister lake to Mono Lake. There were many tufa formations around the lake which are limestone formations formed by the precipitation of carbonate minerals. 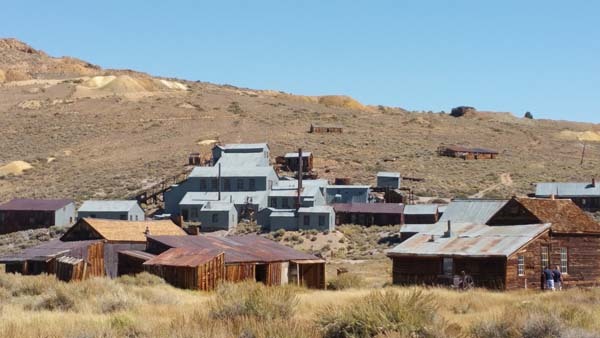 Not far from Mono Lake is a ghost town that was once a thriving mining community. 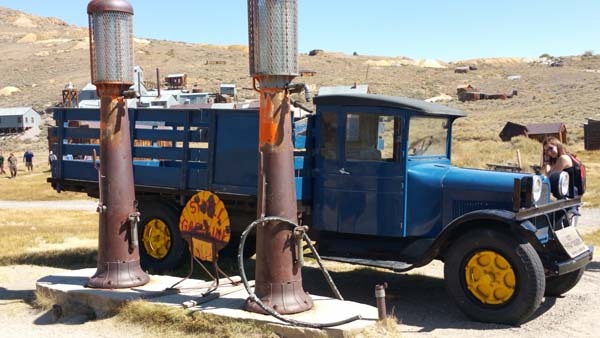 You have to drive down an unpaved road for a few miles before reaching Bodie. The road is long enough that you really to admire the folks who use to travel down this road by horse and carriage. At one point in time, the city had 5,000 to 7,000 people and 2,000 buildings. It revolved around the gold that was mined in these hills. The town was eventually abandoned by 1942. Only 170 buildings remain on site but it is definitely worth a visit if you are ever in the area. We drove to the Bay Area by way of the Sonora Pass which neither of us had traveled. If you haven’t driven this road when it is passable, try it. Don’t do it in an old car because the climb through the pass will challenge your motor. 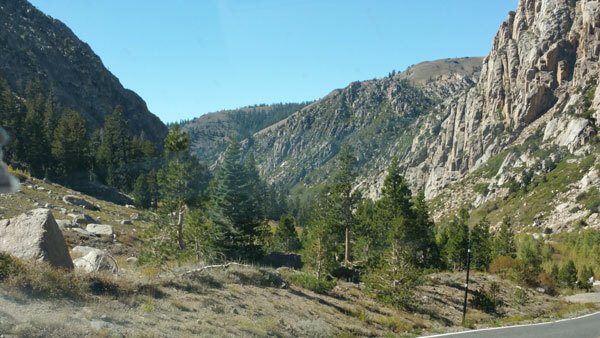 The road from Bridgeport to Sonora is majestic – full of cows and pastures, horses, ranches, giant sequoias, and even the Marine Corps’ Mountain Warfare Training Center. Near the end of the pass you will see skyscraping walls made up of a type of granite known as plutonic rock which also lines neighboring Yosemite Valley. The scenery is one of the prettiest around though your ears will pop at 9,624 feet. By the end of the trip, was glad to be back at 0 feet in homey and somewhat noisier Alameda. I enjoyed your travelogue. While reading your piece I envisioned you delivering it as the late great Huell Howser but with Butchers Daughter flair. My parents would drag us to National Parks as kids. I now appreciate it a whole lot more than at the time. Donna got a kick out of your comment! She loves Huell Howser like you. That almost made me feel like I was on the trip with you. California is rich with history, and we all need to take a page from Donna’s book and learn to slow down and appreciate it more. Wanted to share that I made the slapalicious Prime Rib Roast last weekend for a Thanksgiving celebration. Everyone loved it! I was nervous that medium rare was too much, but I had faith, and it turned out great because some folks liked the ends that had a little more temperature. Thanks Brian! We will be sure to check out the areas you recommended (maybe even during this holiday season). Ah, the magic of 395. Great job explaining the sights. We live in a beautiful country. Thanks for taking the time to share. Enjoy! It really humbling to be beside a living creature that was here before much of mankind and will be here long after you and I will be gone.